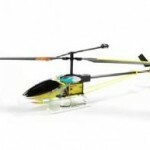 This “Ready to Fly” helicopter is ideal for the novice. No skill needed accept to be able to twiddle a couple of knobs and point the radio control aerial in the right direction. Easy!